Drink coffee. A lot of it. And don’t do it alone. So you want a career in Marketing? Let me tell you about how I got almost every job I have had in my decade and a half as a marketer. I met someone, we talked and later they told someone else about me. I’ve been amazingly fortunate that I have had some great mentors during my career; ones who not only taught me a lot, but let me take (calculated) risks, told me when to shut up and, even years later – continue to say nice things about me to potential clients. Now, not everyone is that lucky and at the start of your career (and when I started mine), you don’t have those people in your life. This is especially true if you have moved to a new city to complete your degree and want to stay there when you graduate. 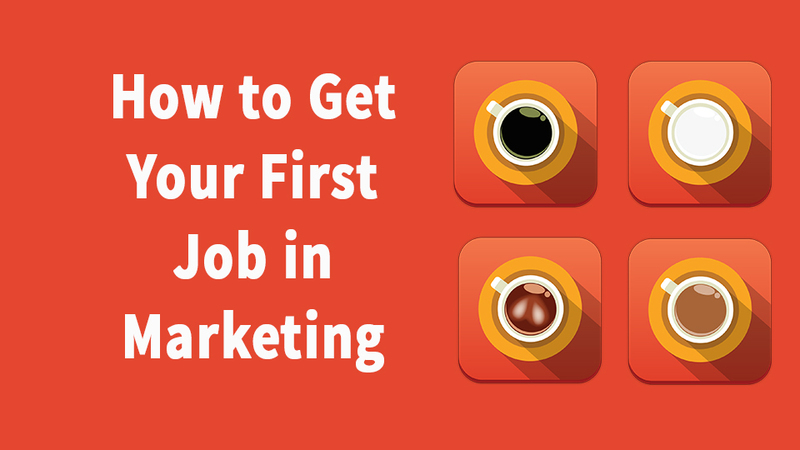 So How Do You Get that First Marketing Job? I have been giving this piece of advice for years and most people who have followed it have had a job in under a month. First, find two or three marketers that you can meet with. Marketers are like mushrooms, we pop up anywhere there is a coffee shop with wifi, so this shouldn’t be hard. If, like my alma mater, your school has a great alumni program, your career or alumni office has a group of people like myself who volunteer to meet recent grads interested in their field. Barring that, go to an industry event, most marketing events have free or very passes for students and recent grads. No luck at option 1 and 2 – hit the Twitters and the LinkedIn’s. Put aside $100 for coffee. You probably won’t need this whole amount, but that is your new job finding budget. Much less than the fortune I spent on stamps, envelopes and heavy stock paper for resumes when applying for my first jobs in the 90’s. Ask these marketers if they can spend 45 minutes telling you more about the marketing scene in your area and/or industry of choice. Most (probably all) will agree to meet you. Believe it or not, we were all in your place at some point and most of us remember how tough and intimidating it was. Failing that, marketers love to talk about themselves and will do so at every opportunity. Step 4: Arrive at the Coffee Shop Early. Also make sure you’ve checked LinkedIn so you know what your contact looks like and when they come in, get up and offer to buy their coffee. Many won’t let you, which is fine, but you’ve showed them the courtesy of making the offer. You’ve demonstrated that you understand this this is the least you can do in exchange for their time. Preface the conversation with the fact that you aren’t looking for them to hire you today. You are however looking to meet with people who can give you advice on how to start a marketing career in your area. Ask how they got their start and what experiences were most important to shaping their careers. Many marketers will tell you that they worked at an agency and then they went in-house. Remember this. An agency is almost always the best place to start your marketing career. That wasn’t my career path, but I was fortunate enough to land somewhere that prided itself on running its own team like an agency. You will learn more working at an agency in a year than you will in-house in five. Consider the first year of your agency life as the first year of your undergrad. You try English, Biology, Commerce, History etc and then you figure out which one is your passion. Marketing is no different. There is no “marketing” job. Generalists are useless, while specialists make more money, rise to the top faster and get noticed. That favor is not a job. Instead at the end of your coffee ask them who else among their peers you should meet with and if they would be willing to provide an introduction. If you seem to have your act together and are personable, they will do this. Follow up with a thank you email that is also a reminder of the introduction they committed to and later provide an update on your job hunt every 3-4 weeks. These all serve to keep you top of mind. We are all hiring, and when we aren’t, our friends are. If you can keep yourself in their thoughts as they grab a beer with their friend who needs a new marketing coordinator, you have a very good chance at getting the job. No one wants to post jobs and interviewing cattle calls is a pain. We’d all far rather sit down with someone that a peer has met and vetted as being human and intelligent. Do this for $100 worth of coffee and I guarantee you’ll have a job. This doesn’t just work for first timers. When I established CloudKettle I had 6-8 coffees or phone calls a day for a month. Every. Single. Day. Admittedly I felt sick from the caffeine every night, but it worked. Almost a year later and I am still reaping the benefits as people have a need and remember their conversations with me. Already a marketer? Why not share how you got your first job in the comments below?